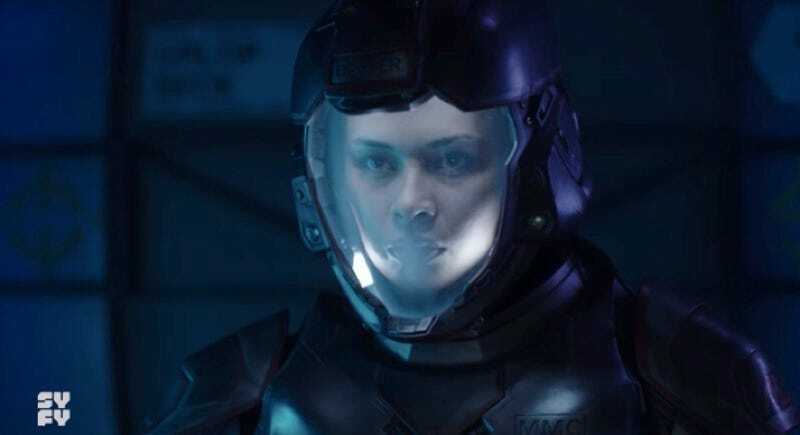 The Expanse’s resident Martian badass, Bobbie Draper (Frankie Adams). And to go with it, at last—the date of the fantastic Syfy show’s much-anticipated return: April 11! Picking up immediately following the emotional and suspenseful second season finale, the 13-episode third season finds Earth, Mars and The Belt at war, with each competing entity vying for control. Now, more than ever, the mission to unlock the secret of the protomolecule reaches an all-time high and every decision made could jeopardize the survival of the solar system. Of course, fans of the James S.A. Corey books that the show is based on have a more concrete idea of what to expect. So far the show has stayed (fairly) faithful to the page; it’s expected that season three will follow the plot of the third book in the series, Abaddon’s Gate. Though there’s no solid glimpse of any kind of cosmic gateway in this very brief trailer—and, alas, no sign of Fred “Hell Yeah I Got the Protomolecule Now!” Johnson—we’ll still take whatever we can get. Thank gawd, The Expanse returns April 11.